What’s the connection between barges and horses? No, not the horses who plodded along the towpath pulling canal barges. But David Rye has found a special one. 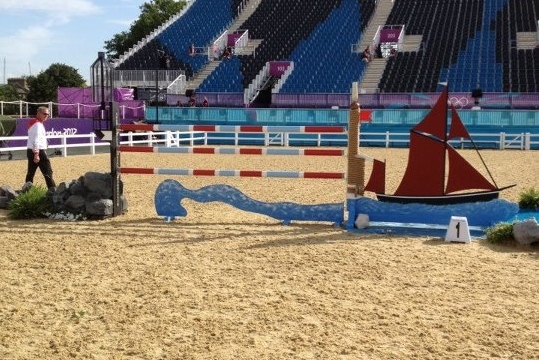 He watched the Olympic showjumping at Greenwich, and noticed that the first fence featured a Thames sailing barge. All the fences looked difficult, with bits sticking up that seemed designed to catch a horse unawares, so perhaps it was not too strange to have one with a lighthouse lamp on top of one post, an oil lamp on the other, and a Thames barge attached to one side. The Thames sailing barge was a type of commercial sailing boat common on the River Thames in London in the 19th century. It had a flat bottom, perfectly adapted to the Thames Estuary with its shallow waters and narrow rivers. These barges also traded much further afield, to the North of England, the south coast and even to continental European ports. Cargoes varied enormously: bricks, mud, hay, rubbish, sand, coal and grain, for example. Due to the efficiency of a Thames barge’s gear, a crew of only two was enough for most voyages. Most Thames barges were wooden-hulled, between 80 and 90 feet (25 – 30 metres) long with a beam of around 20 feet (6 metres). The hull was mainly a hold with two small living areas in the bow and stern; access was through two large hatchways. They were usually spritsail rigged on two masts. The main mast could be lowered to clear bridges. Most had a topsail above a huge mainsail and a large foresail. The mizzen was a much smaller mast on which was set a single sail whose main purpose was to aid steering when tacking. 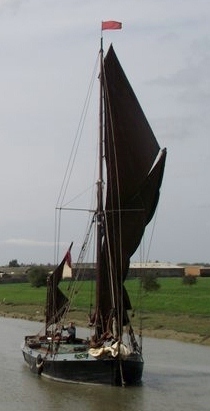 The typical rusty-red colour of the flax sails was due to the dressing used to waterproof them, traditionally made from red ochre, cod oil and seawater. In good conditions a sailing barge could attain a speed of over 12 knots. At the turn of the 20th century over 2,000 Thames sailing barges were registered. Today only a small handful remain, converted to pleasure craft and commonly sailed in annual races which take place in the Thames Estuary. David Rye has let us know that BBC1’s “Countryfile” on Sunday contained a snippet of Cygnet and a little more about Snape Maltings. He says it was in the first 20 minutes. For those who missed it, the programme will be repeated on Friday of this week, for night birds, at 2.35am on BBC1, or should be on iPlayer for a few days.